Great – you now have that new website or blog. Fantastic. How are people going to find you now? Sure, you can post it to your hearts delight to Facebook for all your friends to see. But what about people outside your network, how will they find it. You can pay for advertising and traffic, that works. But you can also spend some quality time thinking what you are promoting and how people will find your site. This usually gets them thinking and they go off and really put some time into this exercise and come back with huge lists. So we take the next step, we sort through these huge lists and pick a few “Keyword Phrases” that best describe their business/product/service. Now we need to see if anyone is actually looking for these keyword phrases. A recent client gave me a big list and we looked at the following keyword phrase that described his business – “Curing addictions, food cravings and overweight”. So when we looked at the monthly volume for this, we saw that no one was searching on this term (in yellow). But we did see where there were some other possibilities (in green). Now what we do is look through this list and pick the keyword (s) we want to target. I like to pick one with decent traffic (over 1000 searches a month) and love to target ones with a below 1 for the Competition score. And now my client can start to write a few blog posts or web pages on cravings, making sure the SEO tags get populated and the blog post themselves have these keyowrds in them. In 90 to 120 days they should start seeing some traffic for these words. Then we can move on to new topics or stay focused and really target these. 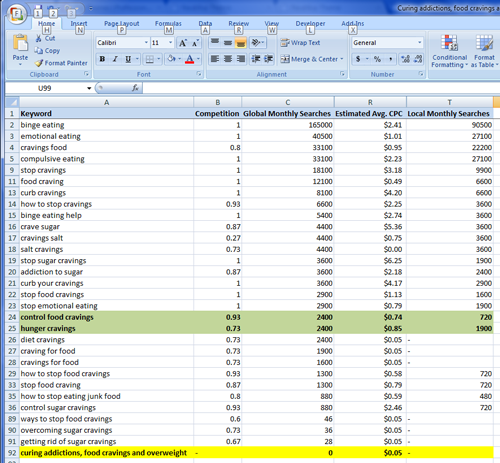 As you can see – just this ONE keyword combination gave us a lot of data and a lot to work with. You need to really pick ONE or TWO phrases to target that you want to focus on (meaning you want to write and promote them). Then we can go from there.